Peter Leonard's third novel confirms the enormous promise of its predecessors and shows that he is not simply an echo chamber to his illustrious father. While he has Elmore's wit and skill at writing razor sharp dialogue, he has highly individual qualities that set him apart. The novel is rooted in personal experience. 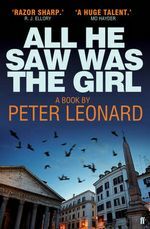 When a student in Rome, Leonard ended a drinking spree by getting into a taxi. As the vehicle was empty, his friend jumped behind the driving wheel and took the taxi on a wild dash through the streets before crashing it. Both students landed in gaol. From this incident, Leonard weaves a captivating yarn in which the pair become involved with a violent gang hatching a kidnap plot. Abducting the wrong student is only one of their mistakes. The beautiful Italian girl who helps them has a change of heart that introduces more chaos. Back in Detroit, meanwhile, Ray Vanelli, a secret service agent, discovers that his wife has been having an affair with Joey Palermo, a Mafia enforcer. When Palermo flees to Rome to escape the enraged husband, Vanelli goes after him. The two stories coalesce beautifully and the suspense is intensified. A terrific read shot through with humour, genuinely scary moments and jaw-dropping surprises.